Criticizing the U.S. Armed Forces is largely taboo. For many, U.S. military programs are a sacred cows, something to be shielded from criticism and any sort of objection. 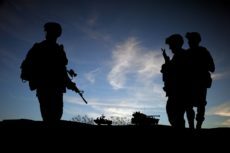 Even those who are usually critical of other forms of government spending and growth balk at the idea of cutting military spending or reducing the U.S. military’s bootprint. The concept of defense as a pure public good, and the way economists and others model national defense, have important implications. When making decisions regarding military operations, it is almost always assumed, by academics, politicians, and lay people alike, that decisions are made in the “public interest.” That is, those responsible for defense policy set aside their own wants and instead focus on maximizing some broader social welfare function. In essence, it becomes a math problem. With this type of framework for analyzing national defense in place, along with the public good assumption, the “optimal” amount of defense may supposedly be calculated and produced. As a result, there is no need to discuss the scale and scope of government activity as it relates to national defense. There is no need to discuss waste. Why? Because our model dictates that just the right amount will be provided! For this economist, such an understanding of national defense policy down right silly. In my own research, I’ve examined whether or not these public interest assumptions do a good job of explaining drone policy—they don’t. But certainly, I’m not the only one to doubt the supposed benevolence of our elected officials with regard to the military and their ability to constrain themselves. In his farewell address to the nation, President Dwight D. Eisenhower warned of the “military-industrial complex.” He discussed the creation of a “permanent armament industry” and warned that the intersection of the military, private interests, and elected officials could have dire consequences. The incentives faced by these actors, he warned, could lead to undue influence and the erosion of freedom. Unfortunately, we have failed to heed Eisenhower’s warning. While we can (and should) talk about the human cost of the military-industrial complex, I’ll leave that for another time. For now, let’s just discuss the monetary cost of the current military. For 2015, military spending is expected to come to about 54 percent of all federal discretionary spending when all is said and done—some $598.5 billion. Some contend that this spending is necessary. After all, if these national defense if produced in the public interest and in the optimal amount, then cutting spending could be detrimental. But examples of wasteful military projects abound. Consider a recent report discussing the Navy’s use of Long Range Land-Attack Projectiles (LRLAPs). Each of these missiles costs some $1 million. Drones, despite the fact they are just as expensive, if not more, than their manned counterparts, do nothing to eliminate terror groups, and despite their failure to reduce civilian causalities, they continue to see increased use. Earlier this year Forbes published a list of the “ten most blatantly wasteful defense items” in the military budget. The list included more than $1 billion allocated for the highly criticized F-35 program, a non-budgeted “submarine spending fund,” and funds to keeps unnecessary military bases operational. Politico found more than $7 billion in unneeded military equipment. So how do we explain these wasteful projects in a world of the public interest assumption? The answer is simple—we can’t. Simply put, the public interest assumption does a poor job of explaining what we see. Instead, we should acknowledge that those responsible for making defense policy are just like everyone else. They respond to the incentives that they face. Policymakers, looking for reelection and campaign contributions, support military programs that will help their districts at the expense of everyone else. Private contractors looking to expand their profits, compete for an ever-expanding piece of the federal budget. Cue Eisenhower. When it comes to analyzing policy, it’s important we get our assumptions right. Our current way of viewing defense policy is not only misguided, but positively detrimental, even if only looking at monetary costs. The appropriate role of the military can be debated at length, but the waste caused by the military is undeniable. It’s time for a revamping of how we analyze the U.S. military. It’s time to put the public interest framework, and some of these sacred cows, camouflaged under the guise of “national defense,” out to pasture.